One of the frequent questions I get asked concerns what qualifications are available to study data visualisation and other related fields. Whilst there has been something of a slow emergence of programmes dedicated to or at least covering this field, there are now seemingly many more options. A few years ago I started compiling a collection of links and descriptions of existing Undergraduate and Postgraduate programmes being offered across the globe (not including MOOCs at this stage) but have noticed that links and courses change so frequently that it needs more housekeeping than I expected. I am now sharing this catalogue in a permanent blog post and inviting institutes, academics and students to help me add new, refine existing or remove courses that are no longer relevant. If you identify any inaccuracies or gaps please email me with details (ideally a couCirse title, a permanent link and short description). This post was last updated on 5th June 2018, thank you to all (in particular Rasagy and Jonas) who have contributed suggestions for edits and additions. "Teaching is innovative and encourages exploration of materials, media, and methodologies related to key subject areas, including social design, branding, information design, typographic media and communication environments. The course addresses a growing need for designers who are original and divergent thinkers who can identify, analyse and solve communication problems. Through our excellent global contacts, you also have the opportunity to take a directed year out in industry anywhere in the world." [Translated] "This course of studies is characterized by its goal-oriented approach to developing creative, artistic, conceptional and methodical abilities. Of particular importance is how the students acquire application-oriented skills and theoretical knowledge. Graduates of this programme have the credentials to become entrusted employees or independent freelance designers in various fields of the Communication Design sector (design, advertising, media, publishing etc.). As a result they are able to react to the shifting demands of the media society in a flexible way. One of the keys objectives of this programme is the personal development of the students. Not only should this course enable them to develop and articulate their own critical stance in a factually substantiated way but also to work as part of a team. Students also acquire key expertise and social skills during an integrated practical semester or semester abroad. Not only does this degree programme provide students with extensive fundamental knowledge and a practical focus, it also enables students to improve their technical skills and prepares them as a result for an appropriate professional position." "Our Digital Media study programmes feature a unique combination of design, theory, and technology. The programme offers aspiring designers a thorough grounding in the artistic and functional application of digital media. Combining experimental and artistic elements with applied studies, the programme encourages young designers to reflect on the wider social context and repercussions of new technologies, while equipping them with the know-how to express their artistic vision." "Graphic Design is about communication. Our students work with design briefs to create stimulating, challenging, beautiful and effective design solutions – in response to wide ranging communication problems. We strive for our students to be creative, critical and autonomous in their approach to design work so that they are able to communicate with the ‘verve’ that we think makes Lincoln distinctive." "Information design (ID) involves gathering and understanding, collaborating and engaging, planning and organizing, writing and design. It is content-driven and contextually-dependent, while remaining in the service of those who will become the information’s users: individuals and communities. We are theory-driven to solve data and knowledge problems. We prioritize efficiency, effectiveness, understanding, and aesthetic quality, while engaging appropriate emotional values. We are not driven by technology: its promises and limitations; but we do have the skills and knowledge to leverage what ever output is most appropriate to address individual and community needs. The Mount Royal University Information Design Program has graduated Information Designers since 2012. We are the only program of its kind in Canada. Our grads work as graphic designers, information architects, web designers, content specialists, technical writers, and UX specialists. They work for not-for-profit organizations, large and small business, oil and gas, healthcare, transportation, and government agencies. They complete graduate studies and own businesses. Their unique ability to translate complicated information into simple terms makes our grads an invaluable resource to employers." "Journalism + Design at The New School is an undergraduate program that combines the rigorous critical thinking of Eugene Lang College with the creative design processes of Parsons School of Design. Students learn serious reporting, visual literacy, community engagement, and digital design, as well as how to develop the imagination, agility, and creative confidence necessary to thrive in today’s media ecosystem. Our instructors are well-respected innovators from the fields of both journalism and design who ground students in the fundamentals of journalism while pushing them to explore its boundaries." 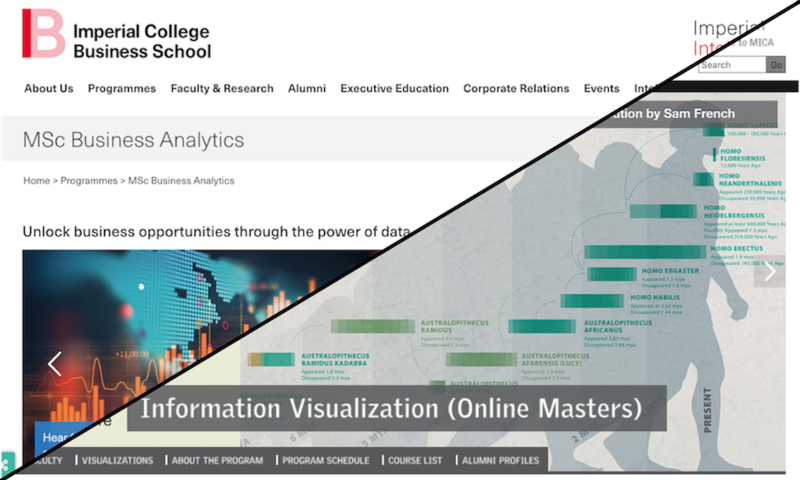 "The Dataviz University Diploma (DU), set up at IUT Paris Descartes, is a short and diploma course offering a concrete and theoretical approach to analysis and visualization techniques and software. Dataviz's main objective is to explore raw data and translate it into interpretable and qualified information. It also offers the opportunity to engage in strategies, facilitate decision making, communicate and transmit. Three areas of expertise are needed here: communication - knowing how to formalize visuals in coherence with the message and in adequacy with the target audiences; statistics - choosing the right indicators and good representations, knowing the pitfalls to avoid; IT - knowing how to develop intuitive, interactive interfaces. This University Diploma offers additional training in concepts and tools for data visualization, for professionals with some computer skills (office software) and little or no knowledge of statistics. The ED will allow learners to progress to positions of analysis and visualization of data in companies, administrations and local authorities. This DU will also support these entities in technical developments in the digital revolution." "Recognised globally, Graphic Communication with Typography focuses on thinking and skills in relation to contemporary understanding of communication and graphic design. The course has three award options in addition to the core award: (1) Identity and Branding, (2) Editorial and Publishing, (3) Information Design"
[Translated] "In the first part of the study, the basics of the foundation, sound craftsmanship and theoretical foundations are taught, the first project experiences are gathered and a first technical orientation is offered. The courses of all three degree programs Interface-, Communication- and Productdesign during the first part of the course are generally taught in a comprehensive study course, although specific concentrations may occur in the course orientation and the workshop courses for a thoroughly intended course of study. The study demands and promotes individual tailoring through a distinctive system of elective courses. The second part of the study is heavily influenced by design work in predominantly project-oriented tasks - 80 CP, ie two-thirds of the 120 CP (= 150 CP less 30 CP for the practical semester), are provided in drafting services. At least one project has to be taken - supplemented by six specialist recesses; a maximum of three projects can be taken - supplemented by two specialist recesses. In addition, there are 3 proofs of achievement as well as proof of achievement in a technical-technical specialization or a complementary subject. An entire semester is reserved for the internship, the inclusive report with 30 CP is credited. This internship semester can be scheduled at your own choice. The completion of the second stage of study is the Bachelor thesis, which is produced during the eighth semester accompanying the study." "This degree is aimed at people who wish to develop working methods in the digital arts or digital media, drawing on a variety of creative and technological disciplines. You will typically already possess some background or interest in one of the core strands (Audio/Music, Still/Moving Image, and Computing) but you will be expected to develop connections with the other fields during the course of your studies. At the end of your three years, you will have the knowledge, skills and innovative drive to compete in one of the fastest growing sectors of the economy, the creative industries. A number of our graduates go on to postgraduate courses in areas of specialist study at Masters Level. Creative Technologies (CT) graduates will complete their three years possessing a range of valuable and transferrable skills in key areas of digital media/content development, delivery, communication and creative thinking. As systems naturally converge, more and more future opportunities will be grasped by innovative teams of interdisciplinary thinkers." "This is the only undergraduate degree in Australia that will provide you with specialised training for a career in interaction design and creative technologies. From websites and mobile apps to internet-of-things products and immersive environments, you will be at the leading edge of today's user experience (UX) design world when you study with us." "Visual Communication is changing rapidly. Design thinking now includes new forms such as story-telling, experiences, and data visualization. Our programme represents an expanded trans-media discipline of communication and expression. When it comes to stories, many creatives have them: Graphic Designers, Authors, Animators, Graphic Novelists, and Children’s Book Illustrators. Be an explorer that uses visuals to create compelling original content in our concentration in Visual Narrative. Likewise, the demand for well-designed infographics is expanding. Our concentration in Information Design has applications far beyond the traditional design professions. Apply to make data-driven messages that sing." "Business intelligence is an umbrella term that includes the applications, people, infrastructure, tools and best practices that allow you to access and analyse information in order to improve and optimise decisions and performance. Business intelligence has become an imperative for both private and public companies and organisations and may lead to cost reductions, better and faster decision-making processes and an easier identification of new business opportunities. The MSc in Economics and Business Administration – Business Intelligence includes a discussion of the procedural and technical infrastructure that collects and stores the data produced by company’s activities. The programme focuses on how to analyse data in order to predict and recognise patterns and on how to visualise and present results in order to support managerial decision-making. The programme will give you the competences and skills you need to take up managerial positions in private and public companies as well as in consulting firms. You will be able to work with the planning and implementation of business intelligence solutions. You will be familiar with various analytical tools and know how to apply these to new cases." "This is a dynamic, practice-led course that will prepare you for work in an increasingly technologically-driven and interdisciplinary world. The course has three distinct areas. You’ll explore these through research, prototyping and making to develop responsive and complex design projects: Interaction – How humans, non-humans, systems and objects interact in meaningful experiences. Design – Addressing aesthetic and strategic needs to seek value in the material world. Communication – The ability to work with narrative and information to craft futures. Develop skills in interaction design, design prototyping and physical computing, user-centred design, open source digital platforms, forecasting and futures, design research, new and interactive media, designing in the anthropocene, strategic design, and critical thinking and making." "The MSc in Computational and Data Journalism is a cutting-edge programme based at the UK’s leading Journalism School (Guardian’s University Guide 2016). It is jointly delivered by the School of Journalism, Media and Cultural Studies and the School of Computer Science and Informatics. This programme provides the perfect vantage point from which to succeed in digital journalist and allows you to develops skills in both data journalism and newsroom development. No previous knowledge of computing is necessary and the programme is open to graduates from any discipline. This MSc is ideal for recent graduates looking for specialist skills in digital journalism and coding that are proven to be in demand by leading organisations. We also work with working journalists looking to develop their skills in this growing area of the industry. As a hands-on programme, it focuses on the development of knowledge and skills through research-informed practical learning in journalism, data science, computer coding and digital development. You will develop a solid foundation in journalism and computing, before specialising in your areas of interest and finally completing a practical and research-based dissertation project using the unique skills that you have acquired. This programme is the perfect foundation for a career at the forefront of digital journalism. It has been designed to respond to a shortage in skills reported by employers and built to develop professional writing and editorial skills. In addition, it delivers specialist training to understanding data, coding and web application development." "Birmingham School of Media's MA in Online Journalism puts you at the cutting edge of these developments, building your multimedia newsgathering and production skills, along with enterprise skills and an understanding of data journalism, the management of user generated content, and online communities. The course, available on-campus or by distance learning, is led by Paul Bradshaw, one of the world's leading experts on online journalism." "This programme is for students who have a numerate first degree or can demonstrate numerate skills. Students are often at the early stages of their careers in diverse professions including economics, statistics and computer science. Students will have a curiosity about data, and will want to learn new techniques to boost their career and be part of exciting current industry developments. The MSc in Data Science includes some complex programming tasks because of the applied nature of the course, so many students have a mathematics or statistics background and enjoy working with algorithms." "City's Interactive Journalism MA will prepare you to work in the rapidly-changing environment of online journalism, with a focus on two key areas: data journalism and community management. You will develop these online specialisations alongside essential journalistic skills of writing, reporting, newsgathering, interviewing and features - core elements of City's renowned Journalism MA programme. Journalism is changing to engage people more as active participants and less as passive consumers. This course prepares you for roles that reflect this change to a more interactive approach." "Creating strong insights while transforming data into narrations. Nurturing accessible complex information. We are surrounded by a large amount of data to be interpreted, analyzed and represented. Information Design is a growing discipline strongly required by private companies, social enterprises and government agencies to crunch, interpret and visualize data for effective internal communications and public relations. The Master in Information Design has a multidisciplinary approach that brings together visual design, data analysis and creative coding. Students will develop a skillset and a mindset to understand different cultural, social and economic contexts, translate complex information into engaging visual forms and narratives that are readable by different audiences, to support comprehensive communication strategies." "There has been a recent upsurge in commercial interest in the new role of "data scientist". This MSc (which can be studied part time or full time) , will prepare you to become a data scientist, a person who excels at manipulating and analysing data, particularly large data sets that don't fit easily into tabular structures (so-called "Big Data"). The program is available either full time (1 year) or part time (2 years). The main teaching is in intensive weeks,for part time study, one in January and one April in year 1 and one in February and one in May for year 2. Full time students do all 4 in one year. The intensive weeks are taught in Dundee and run from 9am to 5pm Monday to Thursday. Friday's teaching finishes at 3:30pm to allow students to travel home. Outside these intensive weeks there will be self study, video and audio lectures, some guest speakers and of course assignments. Full time students will have additional seminars in Dundee." "MSc Business Analytics trains you to understand the context, importance and relevance of the problems facing a business and solve them using a variety of statistical, operations research and machine learning techniques. The overriding objective of the programme is to train students to solve business problems and obtain actionable business insight using analytics. There is a careful balance of teaching and learning, individual and group work and regular seminars by external expert speakers. Case study methodology and class-based discussions are used to strengthen the conceptual, analytical and problem solving skills of the participants in real situations." "The Master in Interaction Design aims to train professionals who aspire to be tomorrow’s digital leaders equipped with the collaborative, critical thinking and technical skills required to react, adapt and leverage the impacts of digital transformation and understand how the digital can be harnessed for strategic design. The Master provides an environment of creativity, design and technological innovation by focusing on projects through a future lens. It provides students with the skillset and mindset to challenge the status quo and produce well-rounded designers who can work across disciplinary, cultural and geographical boundaries to design solutions addressing future individual, societal and business needs by nurturing curiosity, experimentation, technical skills and critical thinking, as well as empathic, collaborative skills." "The New Maps Plus graduate programs at the University of Kentucky offer students a challenging, intensive, digital mapping curriculum that emphasizes the acquisition of technical skills—coding, GIS, web development—while also preparing students to critically address the complexity of today’s information ecosystem." "This course will equip you with the advanced algorithm and programming skills needed to work in data analytics, and the freedom to specialize on particular kinds of data, including text analysis and data mining (online data, health informatics, and business), images (medical applications), and scientific computing and visualization (engineering and science). It also provides you with exposure to other cutting-edge technologies (cloud and mobile applications)." "Businesses, organisations and government agencies are facing ever more complex challenges that require innovative approaches. Increasingly, the field of design is expected to come up with answers and help achieve progress. The purpose of this programme is to train qualified and confident designers who can enter these complex contexts, take on a leading role and co-create solid, sustainable solutions. We are reaching out to students with different backgrounds, not necessarily with previous academic design qualifications, but with excellent design abilities and a desire to develop design beyond specific materials and disciplines. The Visual Media track is focused on design of interactive visual environments, going beyond screens and handhelds towards augmented and immersive approaches. The pedagogical form is studio-based exploration of advanced concepts at the intersection of graphic design, interaction design and information visualization." "The Department of Journalism and Media Management offers a Master of Arts degree in Journalism. The program is an intensive combination of academic study and hands-on practice designed to develop competitive, high-level, cross-platform digital storytelling skills appropriate for today’s media landscape. Students take a common core of courses designed to provide a foundation in all aspects of contemporary journalism. Beyond that, students have the opportunity to focus their work in a particular area of study, including broadcast journalism, news and feature writing, and various aspects of multimedia journalism. Through a combination of journalism courses and related courses offered by other programs, students may also concentrate some of their work in particular areas of interest (e.g., sports reporting, journalism for social change or international journalism). The program begins in the fall semester and lasts for 18 months. No prior training or experience in journalism is required." "With technology constantly changing the way we do business on a daily basis, there is an ever-growing need to keep up with the pace of data as rapidly as it is obtained. The Master of Science in Business Analytics program is an intensive experience that develops well-trained business analysts armed with the skills necessary to understand, manage and make use of big data in a business context. Over the course of 10 months, students learn how to turn abstract data into meaningful information with which to predict consumer behavior and forecast revenue and expenses for virtually any business model and any industry sector." "The University of Miami Interactive Media program aims to prepare a new generation of innovators and leaders in the field of interaction design. Its mission is to explore the use of technology, design, human behavior, and their impact on communication. The multidisciplinary curriculum brings together students from different backgrounds to learn about gaming, mobile, data visualization, interaction design, and other emerging technologies. The program trains students to research, prototype, design, and build projects in business, social, academic, and cultural contexts." "MICA's MPS in Information Visualization prepares students from a variety of fields to translate their existing skills to the visualization industry and related areas. The first such MPS of its kind offered by an art college, the program was created specifically for artists and designers as well as professionals working in fields where the management of complex data through visualization is essential-including architecture, urban planning, homeland security, health, social networking, business, and more." (Please note, after four enjoyable years, I am no longer part of the faculty). "Visual analytics is a key requirement of the early 21st century. As our human activity generates rapidly increasing amounts of new data every day, there is an urgent need to make sense of it and a huge potential to elicit new knowledge and insights from it. World events and phenomena like climate change, 9/11, global finance systems and public health are data rich and increasingly complex. Visual analytics turns large and complex, data sets into interactive visualisations that can prompt visceral comprehension and moments of insight that are compelling and offer an unparalleled richness of possibility for data analysts. In this uncharted world of boundless data, visual analytics is providing our new maps and new ways of navigating. Data analytics is recognised as a key trend that will have a major impact on the IT and Communications industry in the next 5 years"
"This computing course aims to produce high-quality, technically competent, innovative graduates that will become leading practitioners in the field of data analytics. Upon completion of this course, graduates will be able to: Conduct independent research and analysis in the field of data analytics, implement a research idea using the latest industry practices, demonstrate expert knowledge of data analysis and statistics, critically assess and evaluate business and technical strategies for data analytics, develop and implement business and technical solutions for data analytics"
"Information Design program at NID is a multidimensional program that synchronizes the fields of design, visual aesthetics, computer science, statistics and humanities to inculcate a transdisciplinary proficiency into the future Information Design professionals. The Information Design Program aims to create competent design professionals who are adept in varied domains of Information Design, User Interface Design and User Experience Design. The program intends to equip them with the know-how of transforming complex information and data into clarified user experiences on different digital platforms that lead to effective knowledge and insight generation." "Parsons’ Master of Science in Data Visualization is a multidisciplinary program in which students develop skills bringing together visual design, computer science, statistical analysis, and ethical considerations of data analysis and representation. The presentation of data plays a critical role in the shaping of opinion, policy, and decision making in today’s increasingly global society. Giving students a competitive edge as they enter the field, the MS program responds to the increased demand for experts who can turn data into insight. This program is part of Parsons' School of Art, Media, and Technology (AMT)." "ITP is a two-year graduate program located in the Tisch School of the Arts whose mission is to explore the imaginative use of communications technologies — how they might augment, improve, and bring delight and art into people's lives. Perhaps the best way to describe us is as a Center for the Recently Possible." "The first MFA program entirely dedicated to Information Design and Visualization trains students in harnessing visual languages to support discovery and communicate information across a range of socially relevant issues. We seek applicants from diverse backgrounds who are interested in exploring data, visual and auditory design, perception and creative inquiry. Both practicing professionals and recent undergraduates in fields such as architecture, graphic design, journalism, business, the humanities and sciences are welcome to apply." "As digital output increasingly becomes the backbone of most business strategy, there is an acute need for professionals with a better big-picture understanding of information management, design and technology. The Northwestern University online Master of Science in Information Design and Strategy (IDS) program teaches students how to translate information and data into meaningful visual forms, narratives and interfaces. This interdisciplinary program prepares students to step into a cross-functional or leadership role by developing a deep and holistic understanding of today’s sophisticated digital media. The program is particularly useful for people in creative fields who want a stronger grounding in business strategy, so that they can expand their career opportunities and make a larger impact on their organizations. The strong theoretical framework of the program and its focus on fundamental concepts makes the degree applicable to many diverse fields and types of organizations — business, the arts, government, healthcare, and education, to name a few — regardless of changes in technology." [Translated] "The Postgraduate Information Visualization program - a joint initiative of NOVA FCSH, FCT and IMS, three organizational units of the NOVA University of Lisbon - aims to respond to the need to train professionals capable of constructing better visualizations, which are more appealing and ethically responsible. In this perspective, the program has two main objectives: a) make known the concepts, theoretical and practical frameworks and tools essential to professional practice in the area of ​​information visualization; b) to establish the visualization of information as an integral part of the reality of Portuguese institutions, endowing them with specialized professionals in this area. The aim of this course is to equip students with all the knowledge they need to make critical, consistent and well-informed assessments of data visualizations and to produce structurally sound, quality visualizations. It is critical that students understand the main techniques and theories used in visualization, including data models, graphical perception, and visual coding and interaction techniques." "A key feature of the DensityDesign Lab is strong integration between didactic and research activities. Teaching is where we start to develop our thoughts, conceptual tools, and methodologies and remains the arena where we verify our findings. DensityDesign owes its origins to a design course that formed part of the final year of the Master Degree in Communication Design at Politecnico di Milano. Throughout our courses and workshops, we use an interdisciplinary approach to enable students to master visual representation in the widest sense. We draw on the expertise of professors and professionals from several disciplines, from computer science to semiotics and statistics to sociology." "The Master of Science in Data Analytics and Visualization (DAV) program addresses the growing need, both nationally and locally, for researchers, analysts, mapmakers, designers, usability experts, and other data professionals. Drawing on the School of Information’s strengths in Information Science and Human–Computer Interaction, the program prepares students for work across the full lifecycle of data, from data acquisition, manipulation, and storage, to statistical analysis and interpretation, and dissemination of data artifacts through visual and narrative means. The DAV program creates well-rounded data professionals who have strong statistical and technology skills combined with strengths in research, communication, and design, allowing them to ask sophisticated research questions around data, convey information effectively in visual and written communications, and design intuitive, meaningful, and engaging experiences of data." "As a Data Visualisation Designer you can contribute innovative solutions with the potential to transform societal challenges, by designing the human interface to increasingly complex problems. On this course, you will learn how to create rich and meaningful stories with data. We will study digital content in any mode, whether it is in alphanumeric form, binary, vector, pixel, video, or others. The designer provides an important interface, that allows us to explore data and generates meaningful communication. This communication is predominantly visual, but with developments in Wearables and the Internet of Things, is also becoming increasingly physical, affective, networked and interactive. Data Visualisation Design spans traditional graphic and information design, interaction design, information architecture, computational design, design thinking and user-centred and user experience design." "This course builds a base of knowledge, experience and skills for the reflective practice of design. You learn to observe, evaluate and analyse to support your creative practice. Projects range from dealing with complex texts, to design support for wayfinding, to instruction and procedural explanations." "The IED programme is rooted in research, with a cultural and independent creative outlook, supporting practice that is not restricted by industry expectations. This is not a programme for students whose primary practice is limited to predictable patterns of styling information delivery, nor is it designed to promote ambitions that are overtly commercially prescribed or autobiographical. The ambition of the programme is that it becomes a global focal point for research and the place where the key ideas and future forms at the intersection of information design and experience design are imagined." "The Information Arts and Information Design Practices Course at Srishti will explore the idea that all data is narrative. Information is narrative, but with purposefulness. Identity and information environments are intrinsically linked. Stories craft our identity, they heal, inform, challenge and are the stuff of which our lives are made of. While visualization, interpretation and commuication of data have been largely the focus of the field of Information arts and design around the world, at Srishti we dig deeper to engage with ethics, conflicts, politics, hidden realities and debates around data and information. How can art, design and technology be used to push the boundaries of information and create points for action? What can traditional practices from different cultures offer to interpretation of contemporary data? Where can art and science meet to activate alternative research? How does one train at a reflective self in relation to the world to be a storyteller who mines diverse data to arrive at deeper truths? These and more questions serve as a guide map to engaging with and creating within this program. This course is an attempt to explore how to dissolve discipline based perceptions of data to engage with real life in its nuanced stories allowing for new discourses to emerge." "The Master of Interaction Design and Electronic Arts (IDEA) program is the first of its kind in Australia, created to infuse technological innovation with human-centred design thinking. You will explore these technologies and their potential to solve critical problems in areas including biotechnology, sustainability, social networking, urban informatics, wearable technology, health and responsive environments." "The courses in this profile tackle datafication from a unique combination of two perspectives: it teaches a humanities perspective to datafication and its impact, as well as familiarizing students with hands-on data skills like programming and data visualization. The courses offered within the profile Media, Data & Society are: (1) Research Lab I and II, with a specific focus on digital methods, data analysis, and data visualization (2) The Datafied Society (3) Cultural Analytics. Mining Cultural Corpora. In addition, all students have to follow the courses New Media Theories, and the Ludification of Culture, a research internship and write a thesis." "The MFA in Interaction Design is as much about invention as it is about the everyday. It requires students to be intimately attentive to human behavior and to think more holistically about the products and services they create. It explores the strategic role of interaction design in shaping everyday life, and intends to increase the relevancy of design to business and society so designers can make a difference. The definition of “difference” is something only students know—a personal exploration only they can do—and the program is designed to support that exploration over two years. The program is collaborative. In a studio environment, students explore prototyping a range of experiences that cross visual, conceptual and technical boundaries. Grouped in trans-disciplinary teams, students work both in the studio and in the field to create inventive solutions to real-world problems." "Data Science is a rapidly developing field of study within both academia and industry. Its interdisciplinary nature ensures its wide application domain. This MSc Data Science aims to prepare students for a successful career as a data scientist or business analyst working in any profession where large amounts of data is collected, hence there is a need for skills in data acquisition, information extraction, aggregation and representation, data analysis, knowledge extraction and explanation. These type of skills are typically in high demand in IT business, security and health sectors, intelligent transport, energy efficiency and the creative industries. More generally data and analytics capabilities has developed rapidly in recent years. The volume of available data has grown exponentially, more sophisticated algorithms have been developed, and computational power and storage have steadily improved. Most companies, however, are not capturing the full potential value from data and analytics because they do not have the required expertise. Consequently, the MSc Data Science aims to address these challenges by providing a firm grounding in the core disciplines of data analytics and information processing, partnered with a broad appreciation of aspects of other disciplines where data science can form natural synergistic relationships." "The MRes in Advanced Spatial Analysis and Visualisation at UCL Centre for Advanced Spatial Analysis (CASA) started in September 2011. The course is designed to reflect the latest developments in spatial data analysis and visualisation reflecting CASA's reputation in the fields of geographic, urban and architectural information systems. This innovative course provides an exciting opportunity to study at UCL with an MRes acting as a pathway to a PhD or further career in Advanced Spatial Analysis and Visualisation (ASAV)." "The MSc is a new taught degree, training students in cutting edge theory and techniques around data science, visualisation, GIS and virtual environments and can lead to PhD study or a career in spatial data science, GIS or visualisation. [The course offers a] unique focus on analysis, mapping and visualisation, pulling together the latest research in urban form, functionality and communication. Recent changes in the rise of web-based technologies and the abundance of sophisticated, packages mean graduates need a broader understanding of data that extends beyond specific software tools. The MSc reflects this change, teaching technologies and methods that deliver the skills required for future professionals and policymakers interested in data, space, architecture and geography." That’s a great collection, thanks, but some links are not working. Thanks Sandra, yes, I’m going through them all today to check they’re the most updated versions. There’s also the MA in Visual Communication Design from Aalto University in Finland that offers an information design track. There’s this Master programme called Media, Data & Society at the Utrecht University in the Netherlands which states ‘it teaches a humanities perspective to datafication and its impact, as well as familiarizing students with hands-on data skills like programming and data visualization’. Sounds like one you can add right?